We all face several problems and issues related to hair and skin, these common issues are generally hair fall, stretch marks, dandruff, joint pain and desire to get a natural glow on the skin, but do you know there is one stop solution to cure all these problems, yes you heard it right, as rosemary essential oil can easily cure all these problems. And in this article, we have mentioned all such benefits of using rosemary essential oil. Here have a look to know! Rosemary oil benefits are numerous, as it is one of the most amazing essential oil that most people are not aware of. So, here we have listed the benefits of rosemary oil for your skin and hair. Here have a look at the list given below to know such benefits. Using rosemary oil on the skin every day will eventually make your skin get rid of stretch marks. To make this procedure even more effective, you can add rosemary oil into coconut oil and then apply it to the stretch marks. The often you will apply this mixture, the sooner you will get rid of stretch marks. 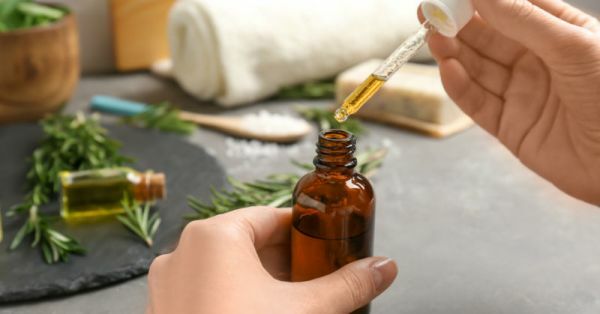 If you are the one who seeks to have brighten, clearer and glowy skin and have tried all the cosmetics, then you are now at the right place as rosemary essential oil is a one-stop solution to get glowing and brighter skin. This oil contains various nutrients and vitamins that will help to make your skin cells nourished and the antioxidants it contains improves blood circulation which leads to clearer skin. Who does not want to look young forever? And rosemary oil is a magical oil that can make you look 5 years younger than your actual age. This essential oily basically reduces age spots, wrinkles, brings glow and tightens the skin making it healthy. Also, the best part about this oil is that you can use it as a natural sunscreen by mixing it with yoghurt and honey. Rosemary oil is anti-inflammatory that helps to reduce swelling and is an analgesic that reduces pain. Also, this oil has been traditionally used to relieve from sprains, joint pain and muscle pain. So, if you or someone you know suffers from joint pain, then this oil is just perfect to recommend. Hairfall and stopped hair growth is one common problem that is faced by every second person, but rosemary oil can even treat that too. Massaging your scalp with rosemary oil can help you to get rid of dandruff and will promote hair growth. All you need to do is Massage your scalp with warm rosemary oil and leave it on overnight and wash your head the next day with lukewarm water. Using rosemary oil helps to make the scalp moisturized and healthy as this oil is filled with various nutrients and antioxidants that nourishes the scalp really well. So, these were the 6 amazing hair and skin benefits of using rosemary essential oil. Why Are Eating Disorders More Common in Women Than Men?